Marine biology researcher Karen Stockin was one of a team from the University to undertake a post-mortem examination of Kelly this morning. A tumour the size of a mandarin is the most likely cause of death of Kelly, Marineland's last dolphin. A team from the University's Veterinary Teaching Hospital completed a post-mortem examination of the 38-year-old dolphin this afternoon. Kelly had been unwell for several days and died on Wednesday. She had been at Napier's Marineland since 1974. Wildlife health centre director Dr Brett Gartrell says the main findings were indicators of Kelly's old age. “But we also found what we think is cancer at the base of her stomach - the mass is being tested and we will know for sure in a couple of weeks. 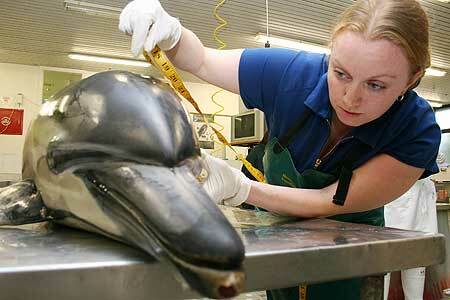 The 95kg common dolphin's body is at the vet teaching facility on the Palmerston North campus. Staff at the University's Institute for Veterinary Animal and Biomedical Sciences undertake post mortem examinations many times each year, on wildlife ranging from birds to marine mammals. Dr Gartrell was assisted by Master’s student Jodi Salinsky and marine biologist Karen Stockin. Ms Stockin is a research officer and lecturer in the Coastal Marine Research Group at Massey's Institute of Natural Resources in Auckland. Her just-completed doctoral research on the New Zealand common dolphin provides the first substantial scientific data on the species. Ms Stockin says the species has been overlooked by researchers as a result of false assumptions based on the dolphin's name. Despite being labelled common, it is in fact not nearly as common in terms of its abundance as some other species of dolphin.